The Vuelta has had a series of uphill finishes and tricky climbs, now comes the first of the real mountain stages with long ascents. Stage 10 Review: once upon a time Greg Van Avermaet and José-Joaquin Rojas were famous for being runners-up, those who had the knack of losing races or at least the statistical curiosity of missing out more often than not. The Belgian has amended this but since this blog crunched the numbers on Rojas and his extraordinary run of fourth places in “Señor Cuarto” two years ago Rojas hasn’t found winning ways, with age he’s become more of a dependable team mate so when he and Matteo Trentin came to the finish together the Italian’s victory seemed inevitable. If Trentin’s sprint win was a certainty his stage win a major surprise, he and Rojas stuck it to the climbers including Jaime Roson – who got the better of Vincenzo Nibali ahead of the Giro this year – in part because Rojas had Movistar team mates behind who were hanging back but it was still a strong ride by the pair. Whether Movistar played their cards right is another question, they could have told Rojas to sit up and used nearby Marc Soler but easier said than done with other riders around to make the finish more chaotic and they’ll be pleased as ever to boost their standings in the team classification. Vincenzo Nibali had a go on the climb but was reeled in. On the damp descent Nicolas Roche sneaked away to take 30 seconds and move up to second place overall. The Route: 187km. First along the coast and then they turn inland. The first climb is the Alto de Velefique, 13.2km long at 8.6% which is enough to rival, say, Alpe d’Huez and this has plenty of hairpins on the way up too. It also climbs well before they reach Velefique too with some 5% segments to deal with. The Finish: the climb to the Calar Alto observatory (astronomical) is 15.5km at 5.9% but as the profile shows this is a climb in two parts, the steep first seven kilometres followed by another seven kilometres across the Sierra de Los Filabres before riding up to finish above 2,000 metres above sea level. The Contenders: Chris Froome has shown he is climbing well and now he can show us what his team can do too. He even has a variety of ways to win the stage, including an attack on the early steep slopes to Calar Alto to go solo followed by some time trial pacing on the gentler slopes before maintaining his lead to the finish. It sounds like something out of the Pro Cycling Manager video game but he’s been looking that easy. Wout Poels could be close too. Alberto Contador faces a big test here, there’s a stage win but also the chance to take back time on others and work his way into the top-10 on GC with a view to climbing higher in the coming days. Esteban Chaves has been close and it’ll be interesting to see how he fares on these longer climbs and with some altitude too. It should suit him more. Among the others in the top-10 it’s hard to see a stage win because they’re all close so for example Fabio Aru can’t clip away because Tejay van Garderen needs to mark him and so on. Still among the outsiders Romain Bardet has space, Ilnur Zakarin can be hard to bring back once away and Rafał Majka seems to be over his stomach problems. Weather: Rain! Cooler conditions and a temperature of just 18°C inland and cooler at altitude. Daily Díaz: The race visits Andalusia, the southern Spanish region that includes 17% of the territory (roughly the size of Serbia), 18% of the population (as many inhabitants as Switzerland), and 26 % of the unemployment (one million people, similar to Greece or Poland). It may not sound as a great place to live in, but it is definitely an awesome tourist destination. You could spend one week in every one of the eight Andalusian provinces (Almería, Cádiz, Córdoba, Granada, Huelva, Jaén, Málaga, Seville) and ask for more. Almería is an example: you have some of the best beaches (Cabo de Gata), plus mountains, natural parks, and a rich cultural heritage. It is the location of Mar de plástico, a two-season long crime drama TV series. The title (“sea plastic”) is a reference to the miles and miles of land covered by greenhouses, where a girl is found dead. A police officer just back from Afghanistan has to find out who did it, and why. Probability of Aru clipping away – 7/10. Probability of TVG being able to mark him – 3/10. Probability of Aru staying away – 1/10. While I’m at it, probability of Froome losing the red jersey before the ITT – 6/10. I’m far from convinced this race is over, Froome’s form looks too good to last through the third week. 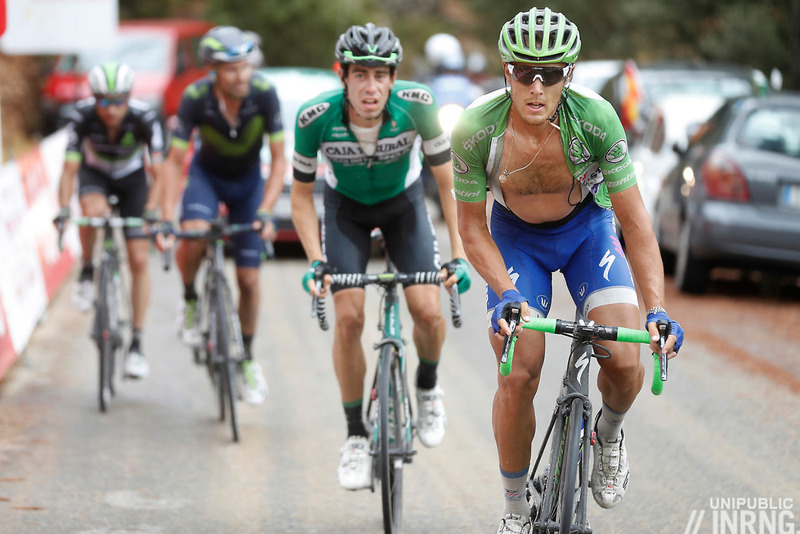 Chaves and Aru could challenge late after late starts to their seasons. I think today will be your answer. It’s unlikely that he’ll be about to challenge in the high mountains. The fact the other gc favourites didn’t bother to chase him speak volumes. They could be very wrong of course. As Somers says we will see today. In fairness I think the most likely reason he wasn’t chased is that there was no TV coverage of him until he crossed the finish line. As soon as this happened, Orica put a man on the front and the pace in the bunch increased. I think a lot of Nico’s problems in the past have been tactical, often going too early or too late or blowing up a few hundred metres from the line after expending too much energy earlier in the stage. This is the smartest I’ve ever seen him race, he’s not doing anything stupid. He knows he can’t and won’t beat the likes of Froome or Chaves in a climb, and that he won’t win the race. That said, he has a better time trial than Chaves and on his day could possibly beat Nibali or even Contador too, and since moving to BMC my guess is that his time trial has even improved. Has always been a solid rider, but not quite top shelf. However, I think he is a good shout for podium if he can limit his losses in the big mountains (big if) and take back some time on all but Froome in the time trial (slightly smaller if). This is going to be a big change on what has gone before, cooler damp (possibly wet / very wet) conditions more alpine than typical southern Spain. This is likely to affect the riders in different ways. We could see one or two contenders loose significant time as they struggle to cope with the change. Alberto Contador is almost certain to try to attack, it will be interesting to see if he has the strength on a longer climb. Vincenzo Nibali is another who will want to gain time though I have some doubts. Others will try too but not sure any of them will have the strength to do any significant damage to Chris Froome. As we saw in the Tour he can hide a bad day pretty well, he is well known for preferring hot dry conditions to cool damp ones. However if he and his team are on a good day then he could go a long way towards achieving his goal of finally winning the Vuelta. Isn’t Roche 3rd overall on same time as Chaves? Chaves having the higher placing due to his 2nd place finish on an earlier stage. With Froome it’s like a video game. Hahaha.. If that doesn’t say it all. A video game is not real and unnatural. With Messi, its like a video game…. Its funny how language works. Use that phrase of a footballer and it means “What a great player who can do amazing things.” Use it of a cyclist and you have people sniggering behind their hands with the unjustified innuendo he’s a cheat. Save it for The Clinic, please. Perhaps a surprise at Trentin and Rojas’ break yesterday although, in hindsight, look at the numbers on the climb on Collado Bernejo – they fall into that ‘power climb’ category (7 or 8%). We’re getting to the point where these sort of climbs are being tamed by more and more of the peloton. Once they were the domian of the climbers, then the puncheurs, then the TT’ers, now the versatile sprinters! David Millar on ITV4 last night made the point that the time gaps on GT’s are becoming more concertina’d and, whilst improved diet, training, equipment, recovery etc is a major cause, one of the prime effects has been this widening of ability to conquer these ‘lesser’ climbs. All of which makes you wonder what the GT of 10 years time may look like, not to mention who may be winning them! You gotta find ways to slow them down, so that drafting count much on an 8% slope (because otherwise we need ever bigger gradients to tell riders apart, which also ruins the reputation of a Tourmalet). For that, you can act on the route or on the material, probably both (much longer stages,limited material). But the point is that they go too fast, and this is bad for cycling (although yesterday’s stage was good). I’m staying in Turre (km75) at the moment and the climb up to Los Castanos is pretty hard, had to put the little hire car in 2nd gear to get up some bits! Should have sent the peloton via El Cortijo Grande, that’s a lovely climb. It’s supposed to be the driest part of Europe, spaghetti-western land, but I hear it’s raining now. – will the break be formed before or after cresting that first incline, hence mainly be filled with climbers or rouleurs, resp.? – how will Roche and Woods (and Contador) fare on the longer climbs? – will some of the lighter climbers suffer from the sudden cold ‘n wet conditions? I can’t help but think that Froome needs to make hay while the sun’s shining on his form. It won’t be like this forever. Meantime, Nibali at least yesterday proved that he’s still frisky at least and Chavez might prove better in the later mountains. Most interesting is that this tour has what I would have considered fairly serious climbs at the end of stages, and they’re just being eaten up by classics-type riders. Really it’s only mega serious ramps now that put the GC and the climbers ahead of the rest. I expect Nibali to be a lot better on these climbs. Contador will certainly try, but will need to go early before Sky set tempo. I think Chavito will struggle, not convinced he can hack it with Froome on these climbs. Roche the unknown. Outside pick, Simon Yates. A lot of people seem to be saying out loud that Froome’s form won’t last forever. Why not? Froome did the same grand tour double last year AND both Olympic races in between. Was his third week form in last year’s Vuelta significantly worse than the first two weeks? In the race I watched Froome got stronger as the race went on and it certainly would be hard to sustain the view that his form was any worse than week one. So I am dubious about this claim which, nevertheless, may still be proved right regardless of what I think. Today is the first of the five big climbing days that are to come in the second half of this race, days 11,14,15,17 and 20. Its a very important day for anyone who has any intention to win the race. Its a big day for Chaves and Nibali because its their first chance to show they can beat Froome due to changing terrain. People have been saying on their behalf that the longer climbs is where they will shine. Well now’s their chance to prove it. Its a big day for Contador because if he gets blown out here then his bluff will have been called. Personally, I ask myself how the Contador of the Tour, who was simply not good enough, could go to challenging for red seriously. I don’t think it will happen because I don’t think it can happen. But we will see. He certainly has an ambush left in him but where to attack today? To take serious time you attack on the Velefique but that will require supreme form to sustain. A more modest strategy sees you attack at the foot of Calar Alto but you need to be able to climb away at the start and then TT your way across the high plains. Is Contador, or anyone else with GC hopes, really that good right now? And then there is Froome. This is the biggest day of the race so far for him too. A win today will surely yield bigger gaps than his stage 9 win did. Indeed, this stage is likely to give the GC classification a more realistic look tonight anyway. A good performance from Froome here will show it was not about small gains and form that’s fading. In fact, as a student of Froome I observe that often its the middle sections of races that are his best. Think about his previous stage wins in grand tours, for example, and they are always in the stage 8-11 range. Thereafter, he often defends outside of an ITT where he attacks, and often wins, again. Froome has often been about making gains and sitting on them and so today is a big chance for him to make a more decisive gap before going full defensive. Maybe the point about Froome’s form is that he _wasn’t_ in good form early last year, and it took him until the third week to hit it. Maybe we all see now that he’s sparkling, and that rarely lasts forever. Which was the Tour in which he was dominant early, and then Quintana came back and obviously could have won if he hadn’t been so conservative and left his big attack until the Alpe d’Huez? He had taken time off Froome the previous day, despite waiting until right until the end of the stage to attack (when he could have been a little more swashbuckling and gone on the Croix de Fer or perhaps the Mollard — and indeed Nibali was up the road to potentially help), and could have done likewise on the penultimate day. The point is that Froome can look in imperious, unstoppable form, and then it can change. He didn’t look in fabulous form early in the Tour this year, but sustained that approximate average all the way in a defensive victory. Here it feels more like the Tour I described above (2015??) where his form did indeed change. That was 2015 and Froome was sick in week 3, refusing to take a TUE for medication that his team were recommending. It is primarily responsible for what I regard as the “Third Week Myth” that some have fallen for about Froome. Of course, all of these riders are operating at the limits of good health and are prey to illnesses as an occupational hazard. But its more often the case, in my view, that Froome’s preferred race startegy is to gain a lead which he then defends, giving him the appearance of having no form in the latter stages of grand tours simply because he doesn’t attack. In order to see the real form though he would need to either be attacked himself or, better, have the need to attack because he is not winning. The problem is that if he is winning then he doesn’t need to. PS I take the point about last year that it was always the plan to start slow and get better. This year his approach has been new and included altitude training in between the two tours which, again to my mind, points towards his favoured strategy of gaining an unassailable lead he can defend. All the more reason to see Froome attack today. I am one of those that has said that I think Froome’s form will dip a little towards the end of the race, for no other reason really than because it has to with him being on top form right now. You seem to mistake this for a suggestion that Froome’s form will drop to the point where he will be beaten. That is not what I am saying. I’m saying that he will drop from a position of imperious seemingly effortless superiority back to somewhere near normality. That will still be enough to see him win this race, maybe some more stages too, unless he has a catastrophe of some sort or his health fails at some point. Health might be his biggest obstacle if it gets a bit wet. You’d imagine doing a 3 week race, altitude training and then another 3 week race isn’t great for your immune system. With regard to Chaves and Nibali and their preferred length of climb. Its hard to judge but I would have said Chaves was quite an explosive climber who does well on what we have had so far, and in Lombardia which he won last year, but less well (though not bad as such) on the long stuff. Like a new Purito. Like Purito he’s so bad at time trials its effectively meaningless anyway. Nibali has won races on all sorts of races and climbs so its even harder to say but you wouldn’t put him down as a long climb specialist. Froome I would have said was at his best on long steady climbs, especially in the past. He’s become pretty good at everything now though. His form on the short steep climbs at this Vuelta so far makes you wonder if he has done specific work on such climbs in the build up. One other who comes to the fore at longer climbs is Zakarin. I’m not saying he’ll be challenging for the red jersey (Froome all the way…), but I expect him to stand on the podium come Madrid. RonDe, I think you forget that the percentages these guys are playing with are tiny. It only takes a half percent drop from the peak for it to be a noticeable drop in form, at the elite level. All I know is this: I struggle to remember a sport where teams or individuals maintain Froome’s current level of superiority for long periods. I would also echo Richard S on this matter and say that I don’t expect Froome to lose, just that I suspect he will not look _dominant_ later in the Tour. He should still have plenty to win, but on some of the drags in the final week — especially the Angrilu, it would only take a quantum of a drop in form for minutes to open up. I take on board the clarifications you and Richard make. Thanks for explaining further. Assuming Froome rides away today, which looks quite likely, plus the ITT, which he’ll put at least 1m 30s into Chaves, it’s Froome’s race to lose. I can’t see him being ambushed again – he’s been planning this all year. But what after that? Next year he’ll have the option to do the Giro, and hold all three GTs at the same time? Or sit it out to focus on a 5th TDF? Both would make cycling history. A great question and one I’ve pondered too. But I’m pretty sure that in the Froome mind Tour number 5 shines much more brightly than holding all 3 jerseys at once. But wait. Surely he wouldn’t be so brash as to try for both?! No, he wouldn’t. He’s seen the other current greats trying and failing the Giro-Tour double. The Tour is always uppermost in his mind and he’s getting to the age where every one he wins might be the last. So it will be all in for Tour number 5 and no Giro regardless of how the outcome of this race affects the significance of that one in historic terms. I would say Froome can do the Giro-Tour double but not next year. More than people failing at the Giro-Tour double in recent years I think the effects of doing 4 Grand Tours back to back on Quintana’s form will be prohibitive for anyone to try that (as a contender) again any time soon, which is of course what Froome would have to do. 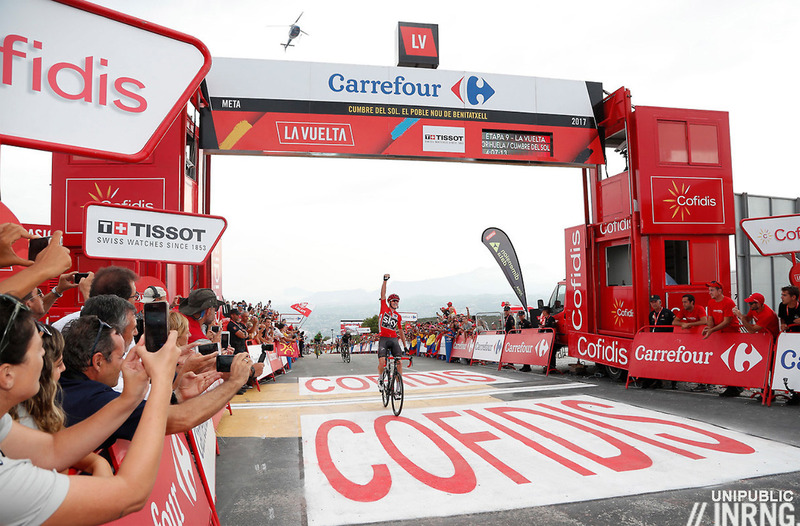 Maybe if he wins this Vuelta he can sit it out next year and go for the Giro-Tour double the year after, but he’ll be cracking on by then and will be trying to win a (potential) 6th Tour so maybe not. My hunch is (and I have nothing to back this up!) is that he’ll try the giro vuelta double. Why not? Giro-tour is probably un-achievable (although they are closer by a week next year, so a different proposition) , so if he wants to cement his place in the pantheon of greatness he needs to add a giro to win all 3 (presuming he wins this vuelta of course) then skip the tour and notch one more GT with next years Vuelta. That’ll then be 7 GTs with a chance of a 5th tour de france the following year. I think you mean they’re further apart by a week next year as the Tour is kicked back a week due to the World Cup. Now follows a lot of “ifs”. If Froome wins this Vuelta and so holds two of the three jerseys simultaneously he will have the opportunity to go for the Giro in 2018 and so become only the third rider ever (after Merckx in 1973 and Hinault in 1983) to hold all three jerseys of the grand tours at once. That possibility must hold some attraction in historical terms. I think, if form and ability were the only factors, that Froome could (not would) win the Giro, not least because in recent years it has been the most time trial heavy of the 3 grand tours. It would also be the only grand tour he needed to complete the set of three and so join Contador and Nibali of his contemporaries in that club. But as Quintana shows, winning is not a given. Its a risk and perhaps more of one for Froome as in his case he prefers dry hot races rather than the icy Stelvio in the rain. But for my money the more decisive factor in why he would not take on that challenge is that he stands on the verge of a possible 5th Tour. Now this is not a given at all. People are lining up to say he is now too old, no one won a 5th Tour at his age, etc. I find that talk a bit strange when the same people name Nibali and Porte, both older than Froome, as possible rivals to stop him. But I accept that its entirely feasible that Froome may already have won his last Tour. But I also think that will be his driving focus in 2018, to match the four five time winners, Anquetil, Merckx, Hinault and Indurain. To the extent that any Giro participation affects this possibility (even if it would make history in its own right if he won) I think the temptation would be brief. But, all that said, 3 jerseys at once or 5 Tours in total is a hell of choice to have to make, one few riders will ever have. PS I’ve also mulled over if Froome will ever match Contador’s 7 official GT wins. I think not. Now is his time and he’d probably need to win this Vuelta, next year’s Tour (which I see as his last possibility to win) and then bag another Vuelta or a Giro somewhere. Not totally unforeseeable but firmly in the realms of speculation. I think he’ll end of 5 or 6. Still not too shabby. Thanks for all this. Yeah, I am inclined to agree – I think the allure of a 5th TDF and the sponsors priorities will over ride any potential shot at glory, as much as we’d love to see it. While I am sure he will want to win all three in an ideal world in his career, I can’t see him sacrificing a potential 5th TDF to do it. It’s a shame really as I think proving himself in all conditions and holding all three at once would be pretty amazing – and certainly one for the fans to say ‘chapeau’ to. Like a boxer holding all the titles at once. But probably not going to happen. I rode Velafique a couple or so years ago. Solo day out whilst on holiday in Cabo De Gata. It was around April so still cold. Amazing wilderness feeling. My strongest memory was actually the descent on the other side and the realisation of how cold it gets even when wrapped up well during a fast descent – i was shivering by the bottom and for some time afterwards. Re: Matteo Trentin – it’s no surprise to me that all Italians do not look like Italians, but it struck me that Trentin speaks English with (what to me sounds like) a Dutch accent! Maybe it’s just all those years in the Quick Step team or is he by any chance from South Tyrol (despite the wholly Italian name)? Trentin comes (fittingly) from trentino region a.k.a. südtirol. Given that Froome took a training camp after the Tour but not at altitude, is there many KMs above 2,000m? And will this play into Chavez’s hands at some stage? Roche has said that the shorter climbs are more suited to him so expect him to lose ground today. And the TT has always been an issue for him against the top GC riders. He may take time on Chavez, but will lose out to Nibali, Froome and Contador there. Judging by what I’ve just seen it will take more than altitude to help Chaves. He and his whole team just blew it big time. Where have all the great climbers gone? This is a question I’ve been asking today. We live now, sadly, in a world of numbers. Cycling fans swap climbing times and power meter figures as markers of a rider’s greatness rather than referring to how they rode a race and bested their fellow competitors. The peloton, as someone else has said, has had a concertina effect upon itself. These days we are used to seeing GC guys come in as a bunch and the mighty mountain eagles of yesterday seem like a fable. Let me give you an example. How many GC riders in the pro peloton have recently attacked the other GC guys on a climb and ended up winning by 1 minute? I don’t know the actual stats here but my intuition is its rare. Make it 2 minutes and I can barely think of anyone. My point is that everyone is actually fairly equal and the differences are relatively small. We don’t see huge, peloton-destroying attacks anymore really. To some this will show that it was always the drugs talking. But, for myself, I miss it. Have we seen a levelling out of ability? Have riders become scared tactically? Is the way cycling is run, riders racing for UCI points for 6th place, affecting what riders will dare to achieve? Its something to think about. Interest has grown, which has increased sponsor interest. Sponsors bring more money to the table. Money increases the stakes. This has lead to a generation of similarly well trained athletes. Almost all the teams have more than one card to play, and the other riders are specialized in what they do, so also very well trained. 30-40 years ago you had one star on the team – the rest were just grunts, cannonfodder. I read the biographies of Merckx and Anquetil and it struck me that they both used a motorcycle/car regularly for pace training. Something which noone else at the time could afford. Look at some of the Merckx stuff on youtube and you can see him leaving his house – a very normal upper working class home. This is what he could afford with what he made – and he was the cycling god at the time, Froome/Sagan/Dumoulin combined.. I believe that in the 70s and 80s there were perhaps 20 guys competing, the rest were just there. Now we have a situation where the money is so big that teams can afford to have 1/2 or 3/4 of their riders potential winners. The world is changing.. There are more big fish in the pond now than before, which makes for more equal racing. The regret I have about this, is that secondary placings are also worth more now. So in this Vuelta we have a fierce race for the podium, of course behind Froome who nobody even dare to believe they can beat. Well except Contador who unfortunately does not possess the ability anymore. I think it might have to do with weight. Riders are so lean, these days, and that mitigates to a certain degree the advantage of the pure climbers. Look at Froome’s arms and chest: he’s maybe a couple of centimetres shorter than Indurain but about ten kilos lighter. Andy Schleck would do this and it almost netted him the Tour. Quintana did this in his Giro victory. Cobbo at the 2011 Vuelta. Sastre on Alpe d’Huez. I think the issue is that when people look back on earlier races they forget all the boring stages and their memory makes them think every day was a slugfest with the greats going at it. Aside from all the related controversy etc. etc. the last great climber was Pantani. The French housewives choice of “climber” was a very poor pretender IMO, and that, even with the preparation! Alas, going off topic. I agree on that account as well. Virenque should never have been able to win the polka dots as often as he did, doping era or not. That final rise was brutal! With the wind and that gradient to come not surprised we didn’t get the Froome show, played the long game today methinks. TVG deserves more respect than he gets but this is probably it now, no one is going to be on him as a GC rider, so stages or domestique may be what comes next. Roche was more expected, did his first week blitz, gave interviews galore, reminded everyone who he is for the next contract talks. Fair enough, talk of a top ten was always crazy. Shame for Chaves, interesting to know if it’s illness or being found out now we’ve hit the high mountains. Nibali best of the rest which was nice, still not really looking like he’s about to best Froome anywhere. Contador there or there abouts, right moment to retire, in amongst the also rans is the most we can expect now. Feels like the year of truth for so many Grand Tour riders? We now know Froome is top dog by a distance even off top form. Dumoulin is the only serious pretender in the short term. Nibali close but only likely to beat either by default. Quintana hopefully not on a downward spiral but needs to bounce back. Bardet not a real contender with his TT skills despite a great year. Pinot had a likewise good year but still looks unlikely to punch to top. but are they and Louis M and Chaves really going to hit the heights with they’re TT skills? Porte and Landa may be the only serious contenders to throw in if F+D go head to head next year. 2017 seems to have given us the hierarchy of GC riders very clearly. Great result for the Superman today. Astana could have a gem there to add to the above list. Quite interesting thinking over top GC contenders with comments above? Think Valverde’s Knee has some rose-tinted glasses on… this has been the era of the climber, with so many and courses made to suit. Partly smaller victory margins are down to windfall of talent not lack. Also maybe biopassport doing it’s job so less riders blitzing away. Maybe gradients of his changing also, like today, encouraging cagey racing. Also not sure people blitzed away in the way the post makes out for the last 30years at least! Debates re RonDe & Froome form. Agree with many things RonDe says, and 50% so here, mystical Froome 3rd wk blues don’t ring true to me but it’s hard to prove a negative and evidence isn’t conclusive so fruitless battle to fight. Froome form curve, likewise impossible to say, those say it will tail off are likely clutching at straws in the hope of a race, but we all know they’re bodies are on the limit so who knows what will happen? We could have windy days, cagey racing because of vicious summits and everyone will still extrapolate that as Froome weakening, so what’s the point in arguing… all neutrals, the history books and fans know the deal with Froome, best leave it at that. We’ll find out one day if external aids were in play, for now I prefer to stick to what we know and celebrate a rider who’s turning into a cycling great. I see being second in the Tour is not enough to be worthy of mentioning. Forgot about Uran, this wasn’t exactly comprehensive, super happy to see him back in the frame though. Never gonna beat Froome methinks. Would be brilliant if he won a GT though. Not if you raced for 2nd no. Seconded! I pitty, but I also think he couldn’t do more. Beat that for length Gabriel! Arguments counts not amount of characters. Having to sort my fantasy cycling team transfers early for tomorrow. Profile suits Sanchez and Alaphillipe and co but I;m thinking Nibali may drag the race in another direction. He can’t out climb Froome and Sky sure as hell won’t let him gain time on the flat so surely his only option is to try tomorrow on a descent….which will have the effect of dragging a few GC riders along with them. He only really has two chances left to do that…or at least try. Any thoughts?…Will Nibali be forced to attack again? I suspect Nibali & Contador will team up at some point and try to induce Froome into doing a Kruijswijk, particularly if the weather conditions continue to make things treacherous. I can’t see any other way. Agreed….Time trial in a few days so they’ll lose more time on that and a summit finish before then. If Nibali doesn’t attack tomorrow it’s almost throwing in the towel. Bookies have Alaphillipe and Sanchez as favourites but I think they’ve misread the situation for Nibali.